This week’s picture book is by celebrated author Matt de la Peña, who has written numerous young adult and some children’s titles. Last summer, Mesa County Libraries welcomed de la Peña to our Central location, where he gave a great teen writing workshop and presentation. 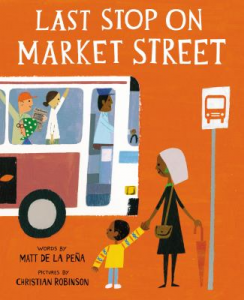 While he is best known for longer books aimed at a somewhat older audience, Last Stop on Market Street is a wonderful picture book that came out this year with vibrant illustrations by Christian Robinson. CJ and his Nana ride the bus every Sunday after church, and CJ has a few questions and observations: why do they have to take the bus every week? Why don’t they have a car like his friend’s family? Why do they have to wait outside in the rain? Nana’s responses are always on the bright side, pointing out all the great things around them big and small – the magic tricks of the bus driver, the man on the bus with a guitar playing a fantastic song, and the trees enjoying a fresh drink of rainwater. CJ and Nana’s observations of the bustling city and all the unique people they meet create a fun and heartwarming story about the beauty of all that surrounds us, no matter where we are.